New Users _ This is a "poke the bear" post. Not meant to be serious. Just bring up memories for us old folks. 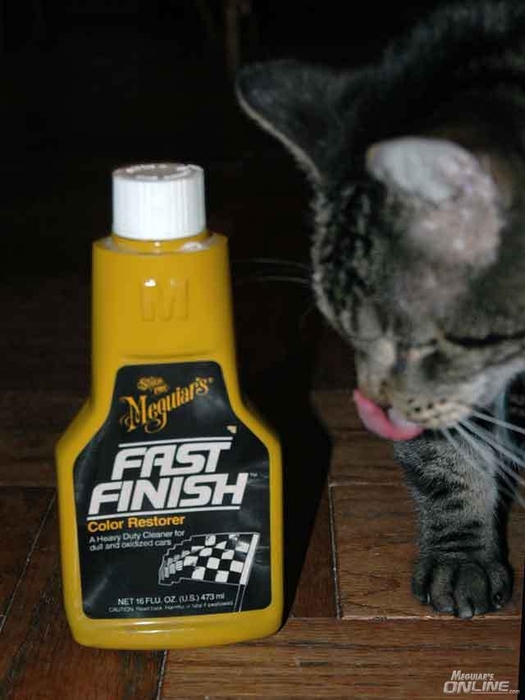 Nick, Is Meguiar's A111 16 what I am supposed to use before using the new Fast Finish? Note my plush microfiber tool to remove it is to the right in the photo. It comes with an automatic dampener if needed. LOL, to be honest I have never even seen a picture of the product you have there Old Bear! Sorry I did not state UV protection specifically earlier but what I meant by "protecting against the sun" is yes, Ultimate Fast Finish and all of Meguiar's waxes have UV protection and UV inhibitors. can you please clarify by what you mean by uv protection and uv inhibitors? I get confused because Optimum has their Car Wax which they explain has UV "inhibitors" which actively protect against UV like Sunscreen, while their Opti-Seal and Coatings are said to passively protect by providing a shield between the sun and the paint. Further more, Optimum car wax claims that their UV "inhibitors" will permeate to the clear coat and replenish the lost UV inhibitors in the clear coat. Has Meguiars done any testing to prove that their waxes/quik waxes are capable of such things too? I use both d156 and Optimum car wax...and only reason I use OCW is because I want to replenish clear coat's uv protection. I would ditch it if D156 can do that. "UV Protection" and "UV Inhibitors" are basically two different ways of saying the same thing. Waxes and sealants almost always contain some level of UV light blockers (a third way to say the same thing - ain't semantics grand?!?!?!) that provide another layer of protection for the paint. But since all waxes and sealants are rather fleeting in their staying power - they are always referred to as "sacrificial barriers" - the level of UV protection they provide is also fleeting. Consider, too, that any wax or sealant coating is only fractions of a micron thin so their UV protection is going to be rather thin as well. Coatings vary from manufacturer to manufacturer, but even the thickest of them is still fractions of a micron thin; some of them measure their thickness in nanometers, and 1 nanometer is equivalent to 0.001 microns (or from the other perspective, 1000 nanometers equals 1 micron) so they are still very, very thin. But coatings are far more durable than waxes and sealants so any additional UV protection they bring to the table (or paint, as the case may be) is going to stick around a lot longer. As for any UV protection actually physically migrating from the coating into the OEM clear coat........hmmmmm.......not so sure about that one, honestly. Given that modern clear coats are essentially a thermoset resin composed of long chain polymers that cross link and bind, it's highly suspect that anything is going to migrate into it and become part of the clear itself, replacing any native UV protection built into the clear coat formulation. Could some migrate into the porous structure of the paint surface? Sure, but then so do waxes, sealants, pure polishes, etc. That does not make them part of the clear, however. It seems that we are getting to the point where we have these new waxes, sealants or whatever paint protection with much more durability with the ease of use (I think) of spray waxes/booster products. After seeing the product demo for the Ultimate Fast Finish, this product from what the demo shows and as long as usage instructions are followed, this seems to be an incredibly easy to use product. Not a bad thing at all, since I believe most of us (car guys or not) don't have that luxury of time, having a product like this which offers durability and ease of use is definitely a welcome sight. I still find fulfillment and joy in more traditional application and removal of waxes and synthetic sealants (paste or liquid). 12 to 24 hour cure time means application of UFF 12 to 24 hours after application and buffing off of Ultimate Wax? or does it mean that UFF takes up to 24 hours cure? The 12 - 24 hour time is referencing after wipe of the product. You just do not want to get the vehicle wet for approx that amount of time after removal of the product for best results. As usual I'm confused by the enormity of Meguiar's product line. Is there any reason why someone should choose Paint Protect over this product? One of the most if not the most difficult questions to answer.. So many variables, conditions, personal preferences even just for these 2 products. One reason can be a person wanting something very easy to use, but with a new "twist".. Something easier to use but a bit more conventional than a durable spray on product, or another possibility is that Paint Protect might offer slightly better gloss at the expense if protection. On the flip side, someone might have an already good paint, and want something that offers ease of use with really good durability, which Ultimate Fast Finish promises.